Suffering from creases or markings on your skin? Has your skin become darker than usual? You may be having a condition called Acanthosis Nigricans. Read on to know all about Acanthosis Nigricans, its causes, symptoms, diagnosis and treatment. 11 Treatment for Acanthosis Nigricans With Creams? Acanthosis Nigricans is a skin disorder that makes the folds of the skin thicker, darker and velvety. The condition mainly affects adults though children can also suffer from it. Though the disorder can strike a person of any gender, descent and age, it is more common in people of African origin. Those under 40 years of age are also at greater risk of suffering from this condition. Acanthosis Nigricans is also known as ‘Acquired Acanthosis Nigricans’. The symptoms of Acanthosis Nigricans mainly consist of the skin turning darker and more velvety. The folds of the skin become darker and filled with creases and markings. Dark rings or patches appear on the skin folds. In Acanthosis Nigricans neck, armpit and groin are mainly affected. In rare cases, other areas of the body such as palms, lips and soles of the feet may also be affected. These areas are mainly affected in people affected with cancer. Acanthosis Nigricans is most often a sign of some underlying condition. Know about some of the main causes of Acanthosis Nigricans. The disease mainly affects people with higher levels of insulin. Excess insulin results in production of melanocytes, cells that are the cause of pigmentation in humans. A high insulin level can result from a number of disorders like pre-diabetes, diabetes and insulin resistance. The disease can also arise from endocrine disorders resulting from obesity. Many obese people suffer from diabetes and endocrine disorders which can trigger Acanthosis Nigricans. Acanthosis Nigricans can be diagnosed by an expert medical professional by mere physical observation. However, skin biopsies, X-Rays and endoscopy may be recommended if the doctor suspects diabetes or any cancerous condition to be the cause. Tests may also be needed to find out the exact cause for this disorder. Acanthosis Nigricans generally disappears after a few days without the need of any treatment. However, persistent symptoms of the disease call for an effective Acanthosis Nigricans cure. In such cases, treating Acanthosis Nigricans requires curing the causative condition. If obesity is found to be a cause, the affected person may have to take up daily exercise to lose weight fast. For obese people with diabetes Acanthosis Nigricans recovery can be faster with rapid loss of weight. Diet modification is also among the most effective Acanthosis Nigricans treatments. Obese and diabetic patients should incorporate low-calorie foods into their diet. The individual should also cut down on his or her carbohydrate intake. A low-calorie and low-sugar diet is seen as an effective cure for Acanthosis Nigricans. Dietary modifications can help both Acanthosis Nigricans children and adults recover within a month. Curious to know whether you have Acanthosis Nigricans or not? Here are some pictures of Acanthosis Nigricans that you may find useful. Check out these Acanthosis Nigricans images and see whether the patches on your skin are similar to the ones shown here. Know what does Acanthosis Nigricans look like. 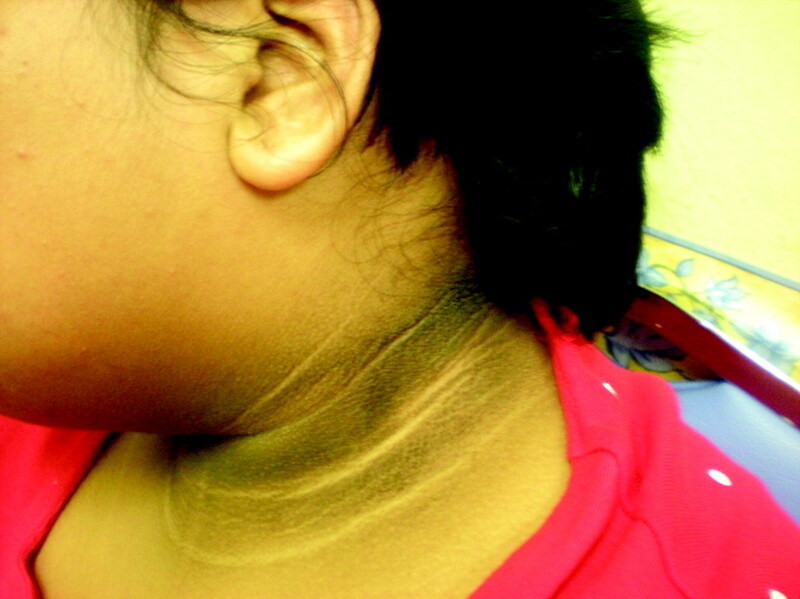 Acanthosis Nigricans usually arises in obese children. Obesity is one of the prime reasons of Acanthosis Nigricans in children. A higher BMI (Body Mass Index) in kids can invite Acanthosis Nigricans. Obese kids are also at a higher risk of developing Type 2 diabetes some years later in their lives. A recent study indicates one in 5 children in the U.S is overweight. This means kids are at increased risk of having Acanthosis Nigricans. For obese kids having Acanthosis Nigricans remedy is usually weight loss by exercise. In rare cases, however, endocrine disorders are found to be the culprit. 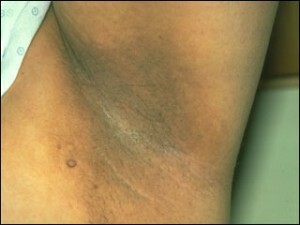 As aforesaid, Acanthosis Nigricans is often seen to arise in diabetic patients. Obese people are frequently seen to suffer from Insulin Resistance, which arises due to Type 2 Diabetes or Pre-Diabetes. Acanthosis Nigricans is a benign or non-threatening skin condition. It may however, be a result of cancerous skin diseases. In such situations, Acanthosis Nigricans can be a sign of life-threatening conditions in the body. Otherwise, it causes nothing more than a hyper-pigmentation of the skin. When Acanthosis Nigricans affects people older than 40 years, it usually results from an internal malignancy or Adenocarcinoma of the uterus or Gastrointestinal tract. Adenocarcinoma can also affect other regions of the body such as breast, prostate gland, stomach, ovary or lung. Acanthosis Nigricans of the tongue or mucous membrane of the mouth is usually a sign of a tumor in the Gastrointestinal Tract. Treatment for Acanthosis Nigricans With Creams? Acanthosis Nigricans rings on the skin look quite unpleasant. 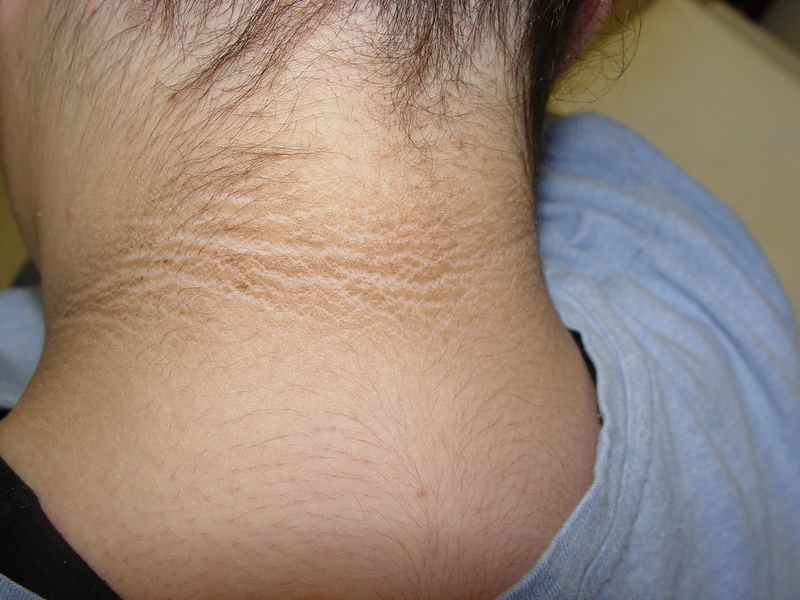 Creams are mostly unsuccessful in treating Acanthosis Nigricans. Many people try skin lightening creams on their body to hide the ugly marks and creases. Mild cases of can be treated using a Glucocorticoid Acanthosis Nigricans cream like Panolog. This is basically a corticosteroid cream which has antibacterial, antifungal and anti-inflammatory properties. This cream rarely gives rise to side effects but it should not be used on pregnant dogs. Acanthosis Nigricans can affect dogs of all ages. Acanthosis Nigricans often arises in Dachshunds due to genetic causes. The disease mainly arises in canines due to Hypothyroidism, Hormonal imbalance, Food allergies and obesity. If you are having Acanthosis Nigricans cases in your family or suffering from the disease yourself, it is best to wait for a week or two. If the rings refuse to fade away, you should opt for medical treatment. Early medical assistance can be useful in preventing all future complications.